We know that you go through great efforts to create awesome content, and these new layouts will give you more options to present that content in a fresh, inviting way, creating a more unique experience for your community. You now have the ability to customize your experience on a deeper level, as these new list layouts can be set up in many ways....each item displayed on the screens above could be configured to house a media item, event, list, giving page, you name it! Want to change your app's layout? No problem. You can easily toggle between each layout option in the dashboard. Just one click gives your app a fresh new look. And if you want to change it back to one of the classic designs, that can happen in just one click, too! 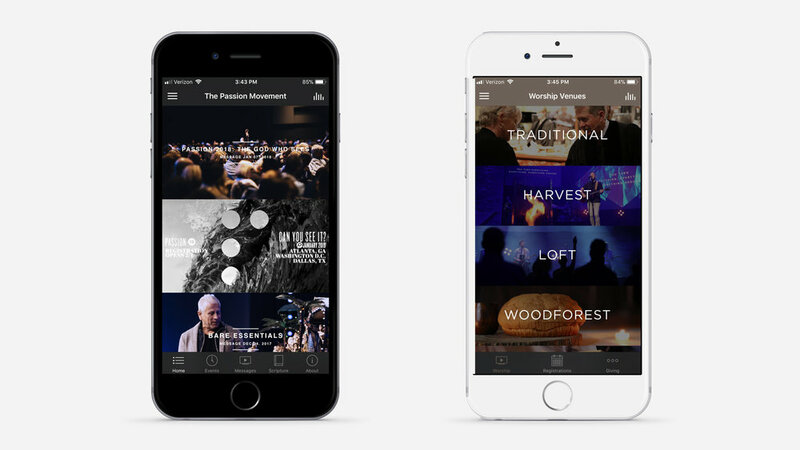 Check out Passion Movement's app to see this new update in action. We're taking customization to the next level, providing you with the ability to control even the smallest details in your app. Want to choose what image size is presented? Wish you could edit the side margins? Want to decide whether your text is displayed over your image, below your image, or not at all? Good news: you can do all of those things. Your app will be uniquely yours, and you can make it that way with just a few clicks. We'll be going live with this feature update very soon... be on the lookout for a dashboard update letting you know that your new layouts are ready. We can't wait to provide you with more ways to customize your content! Older PostCustom Branded Apps Are Back!